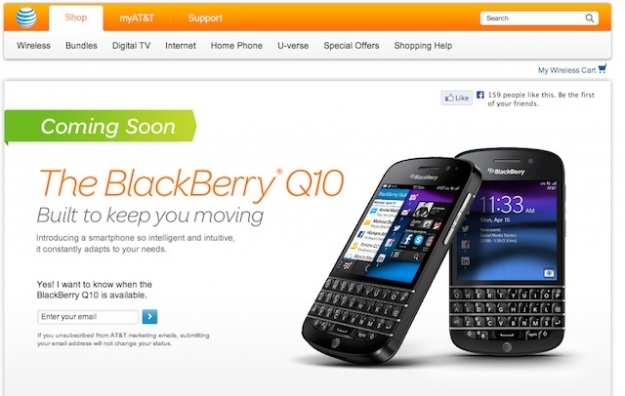 AT&T to start BlackBerry Q10 pre-orders tomorrow | BlackBerry Blast! Not to be outdone but Verizon, AT&T will also take pre-orders for the BlackBerry Q10 starting tomorrow. Verizon was the first US carrier out of the gate with the Q10, but AT&T will join along. The pricing will be the same $200 with a two-year contract, of course. For $200 you get the best QWERTY keyboard on any smartphone in the universe. "AT&T was the first carrier to launch BlackBerry smartphones and services in the U.S. and was the first in the U.S. to launch the BlackBerry Z10 smartphone. Building on our strong BlackBerry heritage, we are excited to announce that beginning June 5 customers can pre-order the BlackBerry Q10 smartphone for $199.99*," said Jeff Bradley, senior vice president-Devices, AT&T. "The BlackBerry Q10 extends the new BlackBerry 10 experience to customers with the physical keyboard they love and the secure platform they expect, all on the nation's fastest 4G LTE network."